Makers, developers and hobbyists that enjoy using the Arduino shields may be interested in a new Arduino development system called StickyBUGs created by David John Barker to help users create their very own custom Arduino shields. StickyBUGs have been designed to provide small modular boards, that allow you to quickly construct an Arduino shield with no wiring or soldering required. Watch the demonstration video below to learn more about this new and unique Arduino system. The Arduino StickyBUGs project is currently over on the Kickstarter crowd funding website looking to raise £4,000 in pledges to make the jump from concept to production. 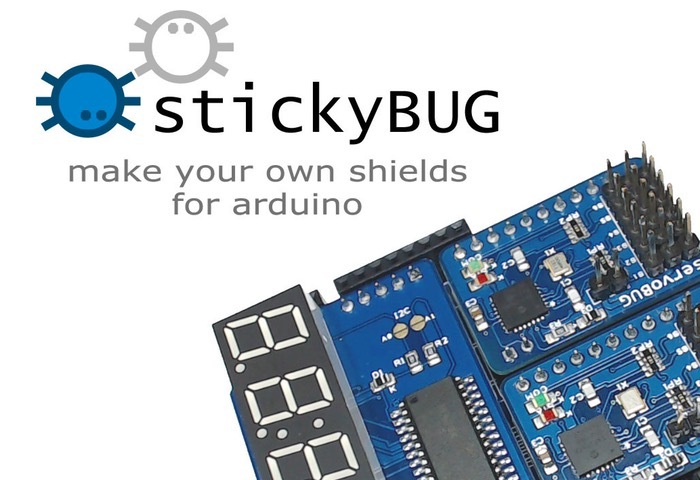 “StickyBUGs are small, modular boards that enable you to very quickly make your own shield, with no wiring or soldering required! Take a handful of stickyBUGs, plug them into the main stickySHIELD and you are ready to go! Full sample and library code is provided. 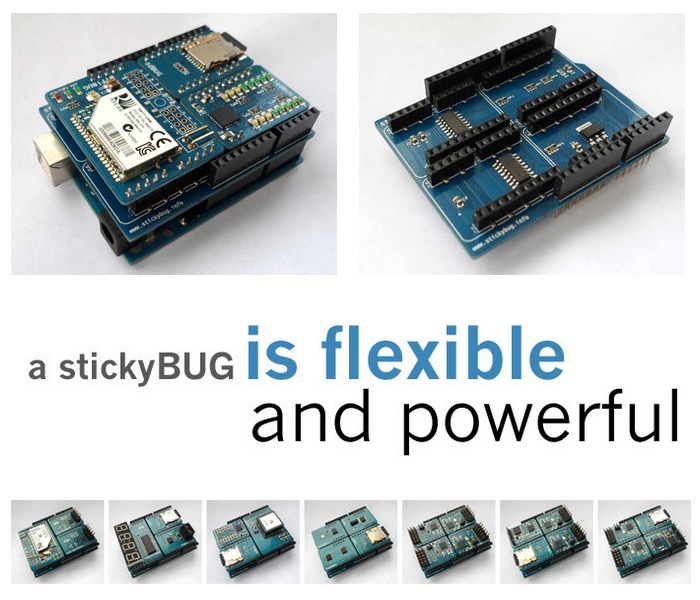 StickyBUGs can be placed in any order, making them the ultimate configurable solution for Arduino development. Now you can create the shield you want that will fit perfectly into your next project. Fast, configurable and low cost make stickyBUGs an ideal addition to any makers toolbox. We all love Arduino shields. They enable you to create many great projects by adding pluggable functionality to your main Arduino board, but they sometimes can have very fixed or limited functionality. For example, try finding a shield that has WiFi and a 12 channel servo control on the same board! With stickyBUGs this isn’t a problem – just place a wifiBUG and two servoBUGs on your stickySHIELD and you are good to go. So if you think Arduino StickyBUGs is something your projects could benefit from, visit the Kickstarter website now to make a pledge and help StickyBUGs go into manufacture via the link below.